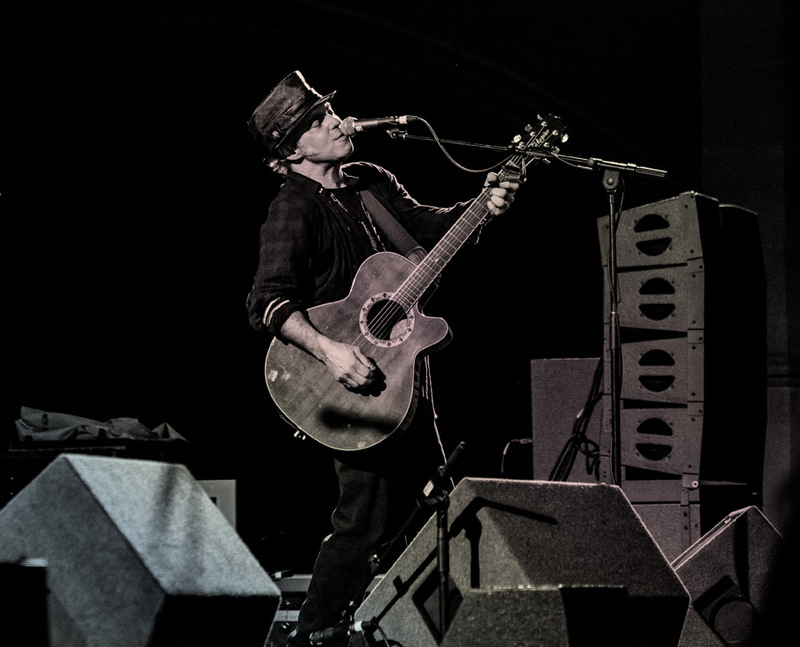 Discussions Magazine Music Blog: NILS LOFGREN: An EXCLUSIVE interview! 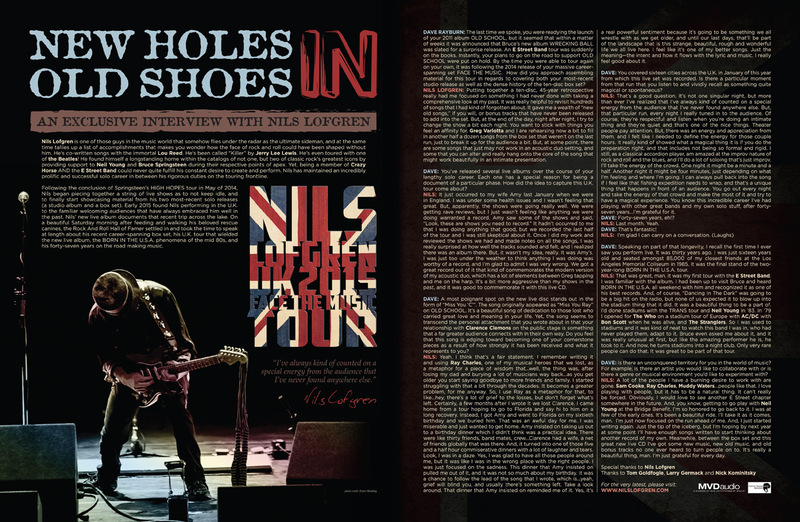 NILS LOFGREN: An EXCLUSIVE interview! Nils Lofgren is one of those guys in the music world that somehow flies under the radar as the ultimate sideman, and at the same time tallies up a list of accomplishments that makes you wonder how the face of rock and roll could have been shaped without him. He’s co-written songs with the immortal Lou Reed. He’s been called “Killer” by Jerry Lee Lewis. He’s even toured with one of the Beatles! He found himself a longstanding home within the catalogs of not one, but two of classic rock’s greatest icons by providing support to Neil Young and Bruce Springsteen during their respective points of apex. Yet, being a member of Crazy Horse AND the E Street Band could never quite fulfill his constant desire to create and perform. Nils has maintained an incredibly prolific and successful solo career in between his rigorous duties on the touring frontline. 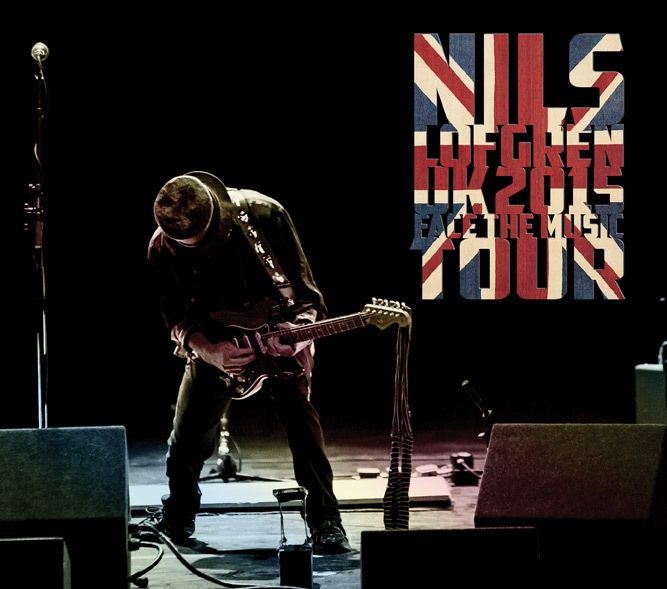 Following the conclusion of Springsteen’s HIGH HOPES tour in May of 2014, Nils began piecing together a string of live shows as to not keep idle, and to finally start showcasing material from his two most-recent solo releases (a studio album and a box set). Early 2015 found Nils performing in the U.K. to the familiar welcoming audiences that have always embraced him well in the past. Nils’ new live album documents that recent trip across the lake. On a beautiful Saturday morning after feeding and walking his beloved rescue canines, the Rock And Roll Hall of Famer settled in and took the time to speak at length about his recent career-spanning box set, his U.K. tour that wielded the new live album, the BORN IN THE U.S.A. phenomena of the mid 80s, and his forty-seven years on the road making music. DAVE RAYBURN: The last time we spoke, you were readying the launch of your 2011 album OLD SCHOOL, but it seemed that within a matter of weeks it was announced that Bruce’s new album WRECKING BALL was slated for a surprise release. An E Street Band tour was suddenly on the books. Instantly, your plans to go on the road to support OLD SCHOOL were put on hold. By the time you were able to tour again on your own, it was following the 2014 release of your massive career-spanning set FACE THE MUSIC. How did you approach assembling material for this tour in regards to covering both your most-recent studio release as well as the dense history of the ten-disc box set? 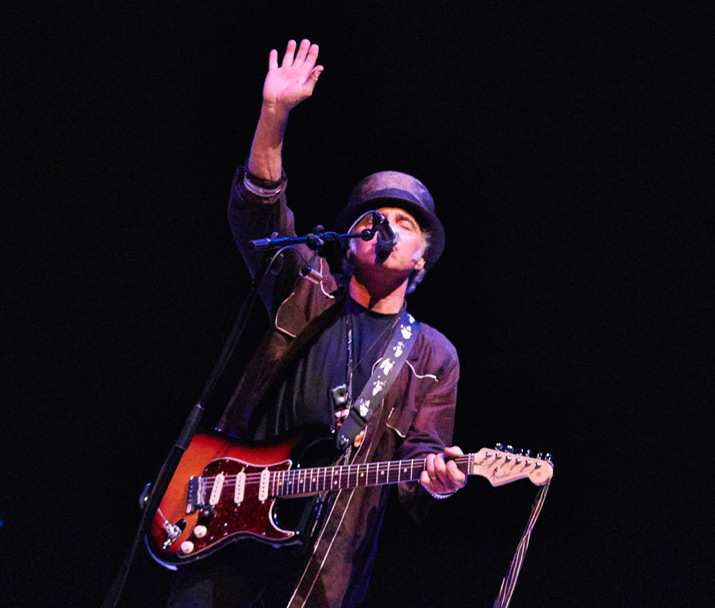 NILS LOFGREN: Putting together a ten-disc, 45-year retrospective really had me focused on something I had never done with taking a comprehensive look at my past. It was really helpful to revisit hundreds of songs that I had kind of forgotten about. It gave me a wealth of “new old songs,” if you will, or bonus tracks that have never been released to add into the set. But, at the end of the day, night after night, I try to change the show a bit each night. You want to stick with things you feel an affinity for. Greg Varlotta and I are rehearsing now a bit to fill in another half a dozen songs from the box set that weren’t on the last run, just to break it up for the audience a bit. But, at some point, there are some songs that just may not work in an acoustic duo setting, and some that you can alter and really hang onto the core of the song that might work beautifully in an intimate presentation. DAVE: You’ve released several live albums over the course of your lengthy solo career. Each one has a special reason for being a document of a particular phase. How did the idea to capture this U.K. tour come about? NILS: It just occurred to my wife Amy last January when we were in England. I was under some health issues and I wasn’t feeling that great. But, apparently, the shows were going really well. We were getting rave reviews, but I just wasn’t feeling like anything we were doing warranted a record. Amy saw some of the shows and said, “Look, these are shows you need to record.” It hadn’t occurred to me that I was doing anything that good, but we recorded the last half of the tour and I was still skeptical about it. Once I did my work and reviewed the shows we had and made notes on all the songs, I was really surprised at how well the tracks sounded and felt, and I realized there was an album there. But, it wasn’t my idea, really. It was Amy’s. I was just too under the weather to think anything I was doing was worthy of a record, and I’m glad to admit I was very wrong. We got a great record out of it that kind of commemorates the modern version of my acoustic duo, which has a lot of elements between Greg tapping and me on the harp. It’s a bit more aggressive than my shows in the past, and it was good to commemorate it with this live CD. DAVE: A most poignant spot on the new live disc stands out in the form of “Miss You ‘C’”. The song originally appeared as “Miss You Ray” on OLD SCHOOL. It’s a beautiful song of dedication to those lost who carried great love and meaning in your life. Yet, the song seems to transcend the personal attachment that you wrote about in that your relationship with Clarence Clemons on the public stage is something that a far greater audience connects with in their own way. Do you feel that this song is edging toward becoming one of your cornerstone pieces as a result of how strongly it has been received and what it represents to you? NILS: Yeah, I think that’s a fair statement. I remember writing it and using Ray Charles, one of my musical heroes that we lost, as a metaphor for a piece of wisdom that…well, the thing was, after losing my dad and burying a lot of musicians way back…as you get older you start saying goodbye to more friends and family. I started struggling with that a bit through the decades. It becomes a greater problem, for me anyway. So, I use Ray as a metaphor for that, to like…hey, there’s a lot of grief to the losses, but don’t forget what’s left. Certainly, a few months after I wrote it we lost Clarence. I came home from a tour hoping to go to Florida and say hi to him on a long recovery. Instead, I got Amy and went to Florida on my sixtieth birthday and we buried him. That was an awful day for me. I was miserable and just wanted to get home. Amy insisted on taking us out to a birthday dinner which I didn’t think was a practical idea. There were like thirty friends, band mates, crew…Clarence had a wife, a net of friends globally that was there. And, it turned into one of those five and a half hour commiserative dinners with a lot of laughter and tears. Look, I was in a daze. Yes, I was glad to have all those people around me, but it was like I was in the wrong place with the right people. I was just focused on the sadness. This dinner that Amy insisted on pulled me out of it, and it was not so much about my birthday. It was a chance to follow the lead of the song that I wrote, which is…yeah, grief will blind you, and usually there’s something left. Take a look around. That dinner that Amy insisted on reminded me of it. Yes, it’s a real powerful sentiment because it’s going to be something we all wrestle with as we get older, and until our last days, that’ll be part of the landscape that is this strange, beautiful, rough and wonderful life we all live here. I feel like it’s one of my better songs. Just the meaning—the intent and how it flows with the lyric and music. I really feel good about it. DAVE: You covered sixteen cities across the U.K. in January of this year from which this live set was recorded. Is there a particular moment from that run that you listen to and vividly recall as something quite magical or spontaneous? NILS: That’s a good question. It’s not one singular night, but more than ever I’ve realized that I’ve always kind of counted on a special energy from the audience that I’ve never found anywhere else. But, that particular run, every night I really tuned in to the audience. Of course, they’re respectful and listen when you’re doing an intimate thing and they’re quiet and that’s one of the nice things. Theater people pay attention. But, there was an energy and appreciation from them, and I felt like I needed to define the energy for those couple hours. It really kind of showed what a magical thing it is if you do the preparation right, and that includes not being so formal and rigid. I still, as a classical accordion player, am amazed at the improv nature of rock and roll and the blues, and I’ll do a lot of soloing that’s just improv. I’ll take the energy of the crowd. One night it might be a minute and a half. Another night it might be four minutes, just depending on what I’m feeling and where I’m going. I can always pull back into the song if I feel like that fishing expedition needs to wrap, and that’s a unique thing that happens in front of an audience. You go out every night and take the energy of that crowd and make the most of it and try to have a magical experience. You know this incredible career I’ve had playing with other great bands and my own solo stuff, after forty-seven years…I’m grateful for it. DAVE: Speaking on part of that longevity, I recall the first time I ever saw you perform live. It was thirty years ago. I was just sixteen years old and seated amongst 85,000 of my closest friends at the Los Angeles Memorial Coliseum in 1985. It was the final stand of the two-year-long BORN IN THE U.S.A. tour. NILS: That was great, man. It was my first tour with the E Street Band. I was familiar with the album. I had been up to visit Bruce and heard BORN IN THE U.S.A. all weekend with him and recognized it as one of his best records. And, of course, “Dancing In The Dark” was going to be a big hit on the radio, but none of us expected it to blow up into the stadium thing that it did. It was a beautiful thing to be a part of. I’d done stadiums with the TRANS tour and Neil Young in ’83. In ’79 I opened for The Who on a stadium tour of Europe with AC/DC with Bon Scott when he was alive, and The Stranglers. So I was used to stadiums and it was kind of neat to watch this band I was in, who had never played them, adapt to it. Bruce even asked me about it, and it was really unusual at first, but like the amazing performer he is, he took to it. And now, he turns stadiums into a night club. Only very rare people can do that. It was great to be part of that tour. DAVE: Is there an unconquered territory for you in the world of music? For example, is there an artist you would like to collaborate with or is there a genre or musical environment you’d like to experiment with? 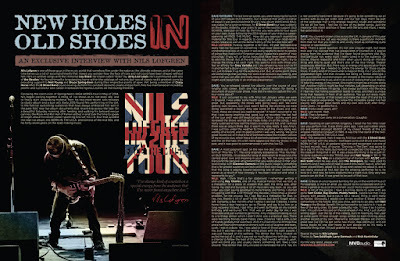 NILS: A lot of the people I have a burning desire to work with are gone. Sam Cooke, Ray Charles, Muddy Waters…people like that. I love playing with people, but it has to be a natural thing. It can’t really be forced. Obviously, I would love to see another E Street chapter somewhere in the future. And, you know, getting to go play with Neil Young at the Bridge Benefit. I’m so honored to go back to it. I was at few of the early ones. It’s been a beautiful ride. I’ll take it as it comes, man. I’m just now focused on the run ahead of me. And, I just started writing again. Just the tip of the iceberg, but I’m hoping by next year at some point I’ll have enough songs written to start thinking about another record of my own. Meanwhile, between the box set and this great new live CD I’ve got some new music, new old music, and old bonus tracks no one ever heard to turn people on to. It’s really a beautiful thing, man. I’m just grateful for every day.